Graduate student Jacob Little co-founded Profane Journal, “an annual print and audio journal featuring an eclectic mix of poetry, creative nonfiction, and fiction” in January 2014. “Part of the fun of the journal is never being certain what’s going to show up in the submission queue. I will say that a lot of people write towards the name of the journal, and we don’t discourage that. We don’t only publish those sorts of things, of course. In fact, I’d say it’s a very minor part. But we do want to be a journal that can take people to uncomfortable places and help them work their way out,” Little notes. 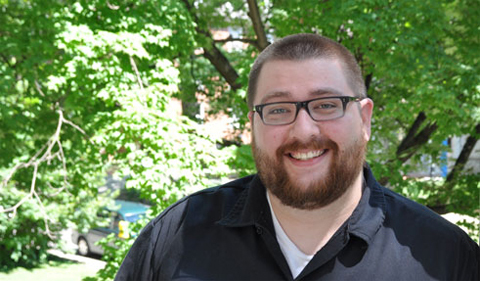 Little is a second-year doctoral student studying creative nonfiction in Ohio University’s English Department, and he currently serves as managing editor for Profane. The journal is currently accepting submissions for its 2016 Nonfiction Contest. OHIO’s Dinty Moore, Professor and Director of Creative Writing, will serve as the contest judge. “The contest is largely a function of encouraging nonfiction submissions. [Co-founder] Patrick Chambers and I both write primarily nonfiction, and we know how challenging it can be as a journal to get good nonfiction work. We always wanted to do annual contests, but this is the first time we’ve felt that we had the team and resources to pull it off. And when we got Dinty on board, we felt like it could really be a draw. I’m excited to read all those submissions,” Little explains. Part of what sets Profane apart from other literary magazines and journals is its unique emphasis on interviews and audio recordings. Each poem, essay, or piece of fiction is recorded in the author’s own voice and then published on Profane’s website. The editors also interview each writer, which is particularly exciting for those who are in the beginning stages of their writing and publishing careers. “Our interviews are often the first for our contributors. It’s an exciting thing, to be able to talk about [their] work with someone who admires it enough to publish it. We believe that this feature is a big reason why we continue to substantially grow our submissions each issue,” says Little. The editors of Profane also emphasize the need for a wide range of voices and levels of experience among the authors they publish. “We’ve had some well-known authors in the journal, like Maggie Nelson, Alex Lemon, David Clewell, Tamas Dobozy, and others. But we get excited when we can put those writers next to first-timers or just people who are fans of those writers,” Little states. Little, Chambers, and the rest of the Profane staff also provide wide support via social media for the many authors whose work they publish. This includes promoting the writers’ work and sharing links to their other publications. Little notes that he and the rest of the staff provide long-term support for their writers. “We think our job is to be an advocate for them, and not just for one issue,” Little explains. The staff of Profane is made up of three overseeing editors and eight readers, all of whom are volunteers. “We do our best to make them feel heard and to give them responsibility and ownership,” especially since reading each submission and making decisions about publication is an enormous time commitment, Little notes. Little sums up the effort involved in publishing Profane as one that involves extensive discussion and collaboration. “We like to generate conversation about submissions and discuss them at length before making decisions. Because of that, our readers tend to be people we’ve worked with, people whose opinions we respect and seek. … We’ve had pieces that we disagree strongly on…that we take simply because we feel that if one of us is passionate about a piece, a percentage of our readers will be too,” he explains. The first and second issues are available to read at no cost on Profane’s website. In addition to accepting contest submissions through Aug. 1, Profane is currently accepting work for its third issue, which will be published in Winter 2016.